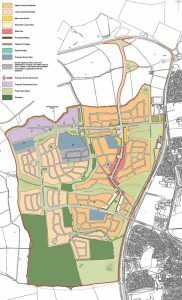 A village meeting has been organised for the developers behind the planned West Corby sustainable urban extension (by the water towers on the A6003) to give villagers a summary of the plans. The meeting has been arranged at the request of Middleton Parish Council and Cottingham Parish Council, to give villagers the opportunity to ask the developers questions about the planning application (reference 17/00180/OUT) and the process from here. This will then inform any comments / additional comments that residents may wish to put to Corby Borough Council and will give the Parish Councils a sense of residents’ views and any particular areas of concern. A leaflet has been circulated to Middleton villagers, which you can view here. The deadline for comments on the planning application has been extended to 5pm on 19 June.